We would love to have you join us for worship! We worship every Sunday at 9 am (liturgical, blended worship). Below is some information about what to expect on a typical Sunday at Good Sam. We would love to have you join us for worship! We are always happy to have visitors because we want to share the joy and love that we have received from God with those around us. We worship every Sunday at 9:00 am (liturgical, blended worship). Below is some information about what to expect on a typical Sunday at Good Sam. 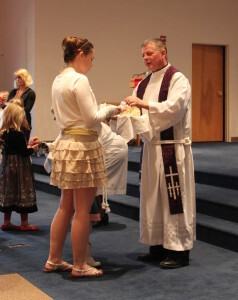 Our 9 am service offers traditional Lutheran liturgy in a relaxed, inviting atmosphere. Liturgy and traditional hymns are led by the piano (with organ for special occasions and some hymns). We also include one or two contemporary praise songs twice a month. These are led by guitar, piano and vocalists. Everything you need to participate in worship is projected on a screen at the front of the church. The order of service (Bulletin) in electronic form via a digital link is publicized in the Grapevine (Sunday Newsletter) which is distributed by the ushers as you arrive. We offer Holy Communion every Sunday at each of our Services. All are welcome at this meal. For us, the Communion meal is an open invitation from Jesus to come and feast upon His gifts: healing, life, and salvation. We offer bread (a gluten-free wafer is available upon request) and wine (grape juice is also available) as physical signs of these gifts. All who are hungry for the life of Christ in their lives are welcome. Children of all ages are welcome at Good Sam. Both of our worship services are designed with families in mind. We have activity bags and children’s bulletins available as you enter the sanctuary. 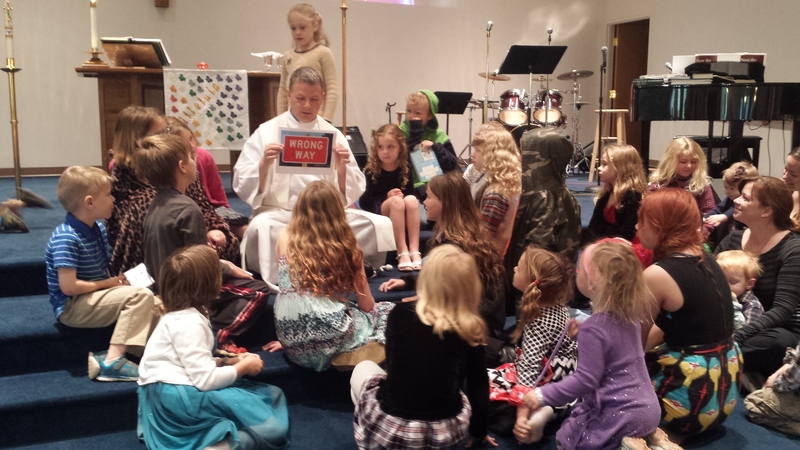 Every service includes a special children’s message from the Pastor or one of our lay leaders. In addition, we have a staffed nursery available, and our cry room (immediately behind the sanctuary) has a window onto the sanctuary and a speaker so that you can follow along with the service while you are there. On any given Sunday, you will find folks in suits and shorts, in jeans and dresses. Please dress in a way that is comfortable for you. God loves you as you are, and you certainly don’t have to dress up for us. We wear name tags as a way of creating community. If you would like to wear a name tag, we encourage you to do so. Extra lanyards and tags are available by the main entrance. Our worship space and fellowship hall are wheelchair accessible, and we offer handicap parking directly in front of the main entrance. Our Sanctuary opens right into our fellowship hall, and we invite you to come and have coffee, tea and snacks during this conversation and community time immediately following each service. We want to get to know you. The coffee pot is on all morning. Each Sunday we have folks helping to lead our worship services. They are called, “Worship Helpers”. You will find them doing everything from Communion Assistant, Reading the Lessons, Acolyte, Usher, Greeter, to Crucifer and much more. If you would like to be a Worship Helper, click here. You can listen to recent sermons by clicking this link: Sermons. You can find our most current bulletin here. Emily and Shannon lead us in our liturgy and our more traditional music or ___ is one of the musicians who regularly leads our liturgy and our hymn singing.